Question: Should I do any preparation before beginning the 8-Day Cleanse? Answer: You don’t have to prepare. You can just dive right in. However, a warm up using the Stay Young Health Kit or even just eating Seven Essentials for a few weeks, first, is a fantastic way to get ready for the Cleanse. The products in this Stay Young Health Kit will prepare your body for doing the actual Eight Day Cleanse by beginning the process of killing candida/fungus in your body and by increasing your nutrition level. This makes for an easier Cleanse experience. The Stay Young is perfect to do after the Cleanse as a year-round regimen. Question: Do I continue taking my current vitamins and supplements during the 8-Day Cleanse? Answer: Vitamins are optional. Do not take protein drinks. Question: Do I continue taking my prescription medicines? Question: Will I get diarrhea from doing the 8-Day Cleanse? Answer: No, diarrhea is not common because this cleanse employs no irritants, peristalsis stimulants or hydragogues. Question: Why can’t I eat high calorie foods such as crackers, carrots, peppers, potatoes, etc. or drink wine or beer, etc. during the Cleanse? Answer: They provide too many carbohydrates/ sugars... feeding fungus growth. Question: Why can’t I eat meat or protein supplements during the Cleanse? Answer: They will interfere with the detoxification goals of the 8-Day Cleanse by attracting enzyme action instead of allowing the enzymes in the Cleansing Enzymes to dissolve toxic waste dumps in the intestines and circulatory systems. The protein provided in the Seven Essentials food powder is predigested— and 100% assimilable, so, it won’t interfere or leave waste material. Question: What precautions do I take if I have diabetes ? Answer: The 8-Day Cleanse will likely cause lowering of blood sugar. We recommend that you discuss your plans with your doctor. You will need to monitor your blood sugar levels frequently and be prepared to adjust your diabetic medication dosages based on readings. Brittle diabetics should eat whole grains during the entire 8 days in order to prevent fluctuations. Question: Should pregnant and nursing mothers do the 8-Day Cleanse. Answer: No, pregnant and nursing mothers are advised against doing the 8-Day Cleanse because toxins released through the 8-Day Cleanse may be introduced into the child. Question: Are there other people who should not do the 8-Day Cleanse? Answer: Yes, persons with Chron’s disease or digestive ulcerations must not do the 8-Day Cleanse. Question: What do I do if I experience headache or nausea while doing the 8- Day Cleanse? Answer: First, you should understand why this happens with some people. A rapid release of toxins occurs during the 8-Day Cleanse. This is a desirable. But, if the kidneys, liver, lymph, lungs or sweat glands (eliminatory pathways) are overloaded with toxins, then headache or nausea can result. This is far more likely if there is a large amount of bad microorganisms in one’s body. A die-off of these microorganisms will occur during the 8-Day Cleanse. The solution for and the prevention of these discomforts is to sweat and rapidly move the lymph through one’s body. Salt rubs, sauna and exercise (walking, stretching, bouncing on a trampoline) will help move lymph and eliminate toxins through the skin. Also, a lymph massage is helpful. Question: What do I do if I start to feel pudgy or bloated during the Cleanse? Answer: First, understand that this means that you are most likely both toxic and undersupplied with minerals. When a person is undersupplied with minerals, the body will try to not lose minerals by retaining both minerals and toxins in water weight (stored beneath the skin), hence the pudgy feeling. In order to convince your body that it does not need to retain minerals we recommend that you consume additional minerals and trace minerals. Our product Kona Minerals is perfect for this. Whichever mineral supplement you choose, you need to eat several times a normal maintenance amount of minerals—but, don’t take so much that you get diarrhea). You will also want to help move stored water in your body out of your body through activities that increase perspiration and through massage. Question: How much weight will I lose during the 8-Day Cleanse? Answer: Although weight loss cannot be predicted individually, we give the following guidelines: People who don’t need to lose weight — won’t. Women typically lose from 6 to 13 pounds and men typically lose from 10 to 18 pounds. Occasionally people lose much more. Often, 1/3 of the weight lost returns within a month. Question: What preparations can I take to have a more successful Cleanse experience? Answer: Although, one can do the Eight Day Cleanse with no preparation at all, we do recommend that for the best experience, you start eating our Seven Essentials daily for up to a month prior to doing the Cleanse. Seven Essentials helps by strengthening your body and starting the process of killing candida in your body. Question: How does one typically feel while doing the Cleanse? Answer: The majority of people (75% of people) feel perfectly normal during the entire cleanse experience. How one feels while doing the Cleanse depends a on a few factors. About 25% of first time cleansers will experience a dramatic detoxification as numerous storage sites for toxins in their body are broken apart and toxins released into the blood stream. The best way to describe this is that you feel like you are coming down with the flu. Fortunately, it typically only lasts two days, and even more fortunately, the ‘sick, achy, or headachy’ feelings can be averted through massages, Epsom salts baths, exercising and sauna, which open up the body’s natural detoxification pathways. Question: How can I get an even more powerful Cleanse experience? Answer: You can eat vegetables the entire time. The normal Eight Day Cleanse includes 4 days of low-calorie vegetable meals only followed by 4 days in which low-gluten grains are permitted to be eaten as well as the low-calorie vegetables. For a MAXIMUM cleanse experience just continue the low-calorie vegetable meals the entire eight days. Question: What if I can’t come up with eight days in a row for doing the Cleanse? Answer: Split the Cleanse into two four day periods. But, remember to consume the Parasite Cleansing formula completely. Don’t stop taking that product until the bottle is gone. Question: What do I do after the 8th day? Answer: You can resume your normal diet beginning the 9th day. Remember to finish the bottle of Paragon (it takes 30 days to finish). If you don’t finish it, some of the parasite eggs and larvae in your body will likely hatch and start their life cycle again. Eight Day Cleanse Blog accounts for more information about what it is like to do the Eight Day Cleanse. Full instructions for doing the Eight Day Cleanse come in the Eight Day Cleanse Kit and in addition, experienced operators are standing by to help you. The 8-Day Cleanse that we offer is the result of Dr. Kellas’s supervision of more than twenty thousand patients at the Center for Advanced Medicine. Dr. Kellas’s Eight Day Cleanse will accomplish more health-improving detoxification of your body in eight days than you could do in 40 days of water-fasting! I recently purchased your 8 day cleanse and was very surprised at how well I felt when finished. I have completed several cleanses in the past, but have to agree that I think yours is one of the best. Becky B.
I have suffered from painful Rosacea for many years. As a result of doing three Eight Day Cleanses during a period of 40 days, I lost 35 pounds permanently . My legs no longer swell like they used to. I no longer experience the pain that I used to have in my face, scalp, nose, ears and I have nearly weaned myself off of taking daily antibiotics in order to help control the Rosacea. Susan C.
I had such a good experience with it, that I had several coworkers do your Cleanse. Sonia C.
I am very impressed your product and especially so as regards how my cravings for sugar have decreased. I now feel that being clean internally is achievable at last! Thank you! Lana H.
See more testimonials from people who have done the Eight Day Cleanse. Feel Younger and Truly Clean Inside! one that looks like this! and FEEL the DIFFERENCE that Internal Cleanliness makes!! So, get clean internally by doing an Eight Day Cleanse. Our Eight Day Cleanse was designed and proven at the Center for Advanced Medicine in Encinitas (San Diego), California. The protocol was perfected during over 15,000 cleanses supervised at the clinic. The Eight Day Cleanse will help you cleanse your internal body more in eight days than you could accomplish in any other way, even with a 40 day water only fast. The Eight Day Cleanse focuses on doing both of the above, on making a powerful cleanse occur in a short amount of time and also in feeding your body some intense nutrition. Help reduce microorganism populations and their toxifying effect upon and damage to the body’s cells. Help dissolve plaque plaque / gel that adheres to intestinal walls, interferes with nutrient absorption and gives safe haven to microorganisms. 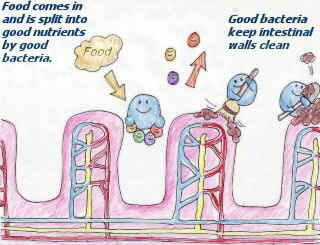 Help heal leaky gut (perforations in intestinal wall linings) so that toxins/wastes do not gain entrance to blood stream which leads to immune system confusion and extra work for blood purification systems of the body, i.e. liver and kidneys. Promote the breaking down of toxin prisons (plaque and lipids ) throughout the body. Help improve circulation by both preventing the clumping of blood cells—by creating “less-sticky” blood— and by removing fibrins from capillaries. Combat free radicals that promote disease and aging. The Eight Day Cleanse provides more antioxidants during eight days than most people eat in a year. Help strengthen the liver and promote the liver’s ability to combat and detoxify allergens. Furnish tremendous food nutrition—thousands of micro-nutrients from seven food types. Help to correct pH—many trace elements only assimilate if the pH is at the right level. Help you to establish a new pattern of seeking to maintain an internally clean and well-nourished body. The Eight Day Cleanse was not created as a weight loss program, however, an interesting companion to its cleansing and detoxifying action is rapid weight loss. Of course, those who don’t need to lose weight, won’t. about 1/3rd of that weight loss returns within a month. By doing several eight day cleanses in a row, people have been able to lose even more weight, up to 50 pounds from doing three eight day cleanses in succession. Although, no one can predict the amount of weight loss someone will experience, for most people, it is a welcome side-effect of the Eight Day Cleanse. Everything you need to successfully complete the Eight-Day Cleanse comes in one product kit. In addition, phone or email counseling is available at no charge for anyone doing the Eight Day Cleanse. We have literally helped thousands of people to change their lives with the Eight Day Cleanse. Please note that it is very possible that a person doing the Eight Day Cleanse program may experience minor discomfort, such as achiness or nausea, as a result of the massive amounts of toxins being broken loose from storage sites within the body. These toxins can overwhelm the eliminatory pathways of the body (an Epsom salts bath, sauna or lymph draining massage can quickly help move these toxins out of you). Some people refer to such detoxification uncomfortableness) as a healing crisis. Such occurrences can be quite disconcerting if you are not expecting them. So be prepared. By and large, such detoxifying symptoms last only one or two days. If you have any questions, please don’t hesitate to contact us. 62% of our customers prefer the Chocolate Flavor of Seven Essentials. So, when in doubt, order chocolate, it’s the favorite. The next most popular flavor of Seven Essentials is Berry at about 30% of total sales. In last place in terms of popularity are Natural and Apple-Cinnamon, each with about 4 and 4 percent of sales. Since the low-calorie vegetables that are part of the Eight Day Cleanse are already a challenge for many people who really don’t like vegetables that much, we recommend that you choose a flavor of the Seven Essentials that you will enjoy. Keep in mind that the Natural flavor is bland... it’s designed to add fruits or other flavors to it (and during the Cleanse, fruits are verboten). 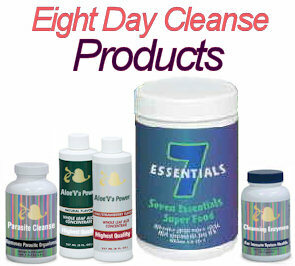 The Eight Day Cleanse also includes our Aloe Vera concentrate product. We recommend that first-timer cleansers order the Natural Aloe Flavor and not the Kiwi/Strawberry flavor, as the flavored Aloe isn’t quite as good at killing sweet cravings. Currently, the Cleanse is only available in 30 serving canisters. Full instructions are available in your Eight Day Cleanse kit and can be viewed here online. A quick description of the Eight Day Cleanse is that it consists of changing your diet for eight days to low-calorie vegetables, healthy oils and spices and water or herbal tea. On days five through eight, you are can optionally eat one serving daily of a non-gluten grain such as brown rice, millet, etc. Also, please see our Frequently Asked Questions about the Eight Day Cleanse section to the right. The Eight Day Cleanse is a systemic enzyme cleanse coupled with killing microorganisms such as parasites and fungus. There are many cleanses that stimulate bowel movements. The enzymes (in the Cleansing Enzymes) act like homing torpedoes (or pac-men) in that they target and destroy toxin prisons, lipids, proteinous gel adhering to intestinal walls and fibrins that clog the capillaries and organs of the body. Removing this mucoidal gel plaque and fibrins helps improve absorption of nutrients as it improves blood flow through the capillaries and intestinal linings. Mucoidal gel in both the small and large intestines interferes with the absorption of nutrients. It also provides homes for fungi, bacteria and parasites. So, removing this gel is like clearing sludge out of a car engine. It liberates the body to function better. Fibrins in capillaries block red blood cells from delivering oxygen and nutrients to cells and in removing their wastes. Our capillaries are somewhat similar to the last mile in telecommunications, extremely important, but are not very often in the spotlight. Most of the attention in telecommunications goes to communications lines going under the ocean and the fibers running under our major highways. Far less attention goes to the bit of telecommunications wires that go to each office, home or apartment unit. It’s the same way with our blood supply, when you realize that red blood cells actually have to bend in half to travel down a capillary, you realize that if your arteries are partially blocked with plaques, then your capillaries were long ago blocked. We need to free them up so that oxygen and nutrients can quickly reach the cells throughout our body and wastes can be removed. Additionally, the Eight Day Cleanse employes powerful plant botanicals that kill fungi, bacteria, viruses and parasites throughout the body. These microorganisms are a great burden on the body by taking food resources, by directly damaging our tissues and by releasing their toxic wastes into our body which must then be detoxified by the liver or stored as extra filth within us. So, killing microorganisms is an essential part of cleansing the body. The Eight Day Cleanse also includes a 28 times strength Aloe Vera concentrate that is very helpful in promoting cellular healing of ulcers and leaky-gut. Aloe Vera is known through history as one of mankind’s greatest healers and we include the very best in the Eight Day Cleanse. The Eight Day Cleanse is truly an experience in Spring Cleaning. Often in life, really important projects go undone for years because the pace of life doesn’t allow us to get to doing these important, but time/energy consuming jobs. It’s like that in our bodies too. When we continuously hard to digest foods, our cells and systems of the body are unable to focus on house-cleaning projects that they would like to do, but simply don’t have the opportunity to do because we keep them so busy processing incoming hard to digest foods. When we stop eating those burdensome foods, and focus on supplying the body with very simple foods and also supply the body with super cleansing tools such as are in the Eight Day Cleanse, it can focus on cleansing in a VERY BIG way. You will accomplish tremendous amounts of internal cleansing in just eight days. Finally, the Eight Day Cleanse includes Seven Essentials with its powerful array of health rebuilding nutrients and antioxidants. Seven Essentials ensures that your nutrient needs are met while you are cleansing your internal body. Both during the cleanse experience and daily, Seven Essentials is simply the best way to help your body feel great. 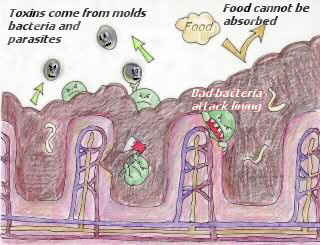 Keep in mind that any time one is breaking down toxic storage sites, free radicals in the body will increased markedly. Having antixoidants standing by to neutralize them is so important. Seven Essentials is what allows a person to grow stronger during the eight days of cleansing instead of weaker. Every part of the Cleanse was fine-tuned at the Center for Advanced Medicine with over 20,000 patients. If you follow the Eight Day Cleanse instructions, you will do a tremendous amount of internal cleansing.